Serve these lively, layered parfaits of fruit and couscous for a smart start in the morning. In a medium saucepan bring the milk and salt to boiling; stir in the couscous. Simmer, covered, for 1 minute. Remove from heat; let stand for 5 minutes. Stir with a fork until fluffy. Cool. In a small bowl combine the yogurt, sour cream, honey, and lemon peel; stir into the couscous. In another bowl combine desired fruit. 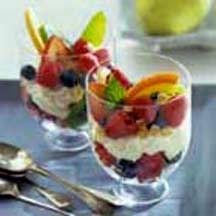 To serve, divide half of the fruit mixture among 6 parfait glasses. Spoon couscous mixture over fruit; top with remaining fruit. If desired, garnish with chopped crystallized ginger and mint. Make-Ahead Tip: Prepare couscous mixture; cover and chill up to 4 hours. Prepare fruit; cover and chill up to 4 hours. Nutritional Information Per Serving (1/6 of recipe): calories: 127, total fat: 2g, saturated fat: 1g, cholesterol: 6mg, sodium: 70mg, carbohydrate: 22g, fiber: 2g, protein: 5g. Exchanges: 1 Starch, 1/2 Fruit, 1/2 Fat.